Our cardboard tubes provide the perfect solution for posting any A3-sized documents such as architectural plans, posters and prints. Made of tough and strong cardboard, our postal tubes provide complete protection to your items during transport or in storage. Additional security is given by the white plastic ends of the tube poster, which stay put and will keep the contents firmly in place. An economical packing solution, the mailing tube is easy to use. Simply place your rolled document inside and it’s ready to go. The cardboard postal A3 tubes are supplied in packs of 25. 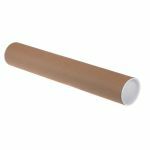 Great for prints, calendars and drawings, our A3 cardboard tube will completely protect your items in the post or storage. Tightly fitting end caps hold the packaging tube’s contents in place and prevent damage or loss. Seal with adhesive tape if you require extra security. Our mailing tube provides a professional presentation making it ideal for those who want to impress their clients or submit an important business proposition. Versatile and rigid, our postal tubes are also perfect to store documents such as artwork, plans and blueprints, or other important papers that can be rolled. Cardboard tubes are invaluable when it comes to moving house or office premises as you can simply roll up those precious posters and plans and ship them without creases, folds or tears. Made from recycled cardboard, our durable A3 cardboard postal tubes can be reused many times, offering you a balance between strength and affordability.